In early 2017 we established the Elder Laboratory (ElderLab) for testing technology for seniors. We did this in order to be able to validate our Best Practices Guidelines, develop our ElderTech Simple Steps instructional materials, and test senior related technology concepts, prototypes and products. In doing this we were very mindful of the need to represent the broad range of physical and cognitive impairments, socioeconomics, family support networks, and living environments. This broad representation is critical in testing technology for seniors. The ElderTech Lab was established in collaboration with Philips-Strickland House and the University of Maine Center on Aging. The Center on Aging provides working connections to hundreds of researchers spanning a dozen disciplines and access to aging related programs and constituencies throughout Maine and New England. Philips-Strickland House is one of the oldest assisted-living non-profits in the state of Maine. It houses approximately 47 elderly residents in its assisted living facility, and an additional 36 elderly residents in the attached Boyd Place independent living facility. Philips-Strickland provides nursing and hygiene services common in assisted living. Boyd Place residents are independent and care for themselves. This connected assisted-living plus independent-living environment provides us with access to a broad group of “Consulting Seniors” spanning 68 to 104 years in age. Beyond age, residents span a range of socioeconomic and family-support profiles. Most live by themselves, but a few live with a spouse. Some are affluent and self-funding; others depend on public assistance. Some have strong family support systems; others are completely on their own. Most are somewhere in between these extremes. Having this cross-sectional representation is important when testing technology for seniors. 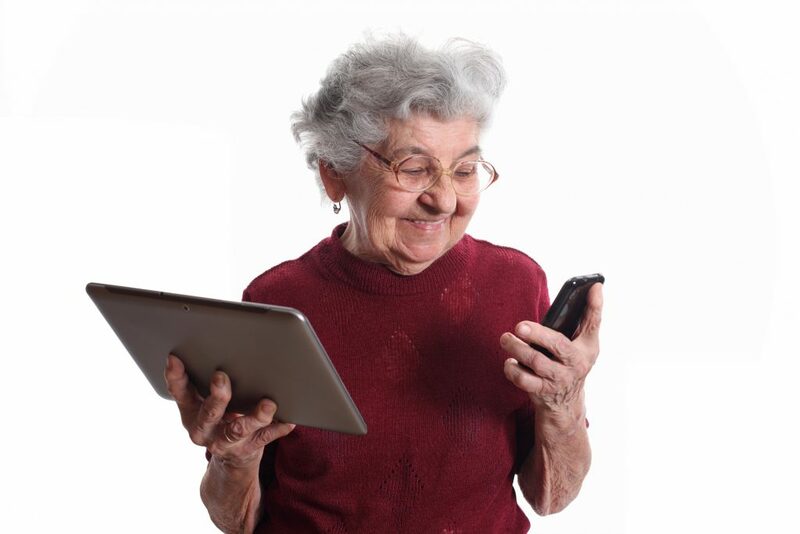 Our Consulting Seniors suffer from most of the physical impairments associated with aging that can affect the use of technology. These include vision impairments, hearing issues, speech problems, hand tremors and other movement control challenges. Some suffer from mild to moderate forms of dementia or other cognitive impairments. None suffer from full Alzheimer’s. Observing and understanding these physical and cognitive challenges, as well as the previously discussed socioeconomic and family-support diversity, is critical to designing and testing technology for seniors. The ElderLab provides an environment where we can do so,cost effectively. Most ElderLab functions take place on-site at Philips-Strickland House and Boyd Place. Living quarters at these facilities range from simple one-room one-bath units to multi-bedroom independent living apartments with full kitchens. These living quarters represent a range of internet connectivity scenarios – from excellent connectivity to unreliable connectivity to no connectivity. We have found that there is no substitute for actual living environments when testing technology for seniors. ElderLab functions are carried out by ElderTech.Org staff and University of Maine students (starting Fall 2017), with support from Philips-Strickland House management and staff. Operations are funded by Philips-Strickland House, ElderTech.Org and the University of Maine System. Grant and funding proposals are in the works to expand ElderLab programs and locations for testing technology for seniors. Okay, are you curious about what the number technology issue is that frustrates our Consulting Seniors more than anything else? Yes … it’s the TV remote! You would think that after being around for 50+ years, TV remotes could provide a better user experience then they do (for all age groups). Go figure. Please contact us if you are interested in having us test your products or ideas, or if you wish to establish your own laboratory for testing technology for seniors.